Vaudeville: 1913 is a re-creation of an authentic Vaudeville show of the early 20th century. The show features songs, dances, jokes, comedy skits, and “silent” films from the period. Sponsored by the Carleton College Music Department and the Vintage Band Festival, this show features songs sung by Mary Martz and Ben Allen, tap dancing by Lynn Deichert, a dog act by “Chester, the soccer-playing Yorkie,” and a feature film, Back Stage, starring Roscoe “Fatty” Arbuckle and Buster Keaton. Many songs will be accompanied by original hand-painted illustrated song slides from the MarNan Collection in Minneapolis. The show also commemorates the 100th anniversary of the sinking of the HMS Titanic, with an original newsreel of the event, and some nautical songs. 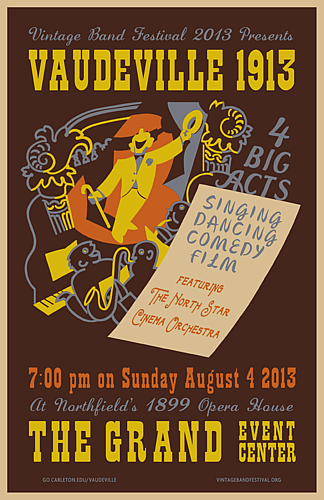 The North Star Cinema Orchestra is an authentic 12-piece vaudeville chamber orchestra (such as groups that would have performed in medium-sized vaudeville houses), consisting of faculty from the Carleton College Department of Music in Northfield, MN. Once a vaudeville house itself, The Grand Event Center in Northfield is a perfect setting for the show.